LISBON: Prime Minister David Cameron agreed yesterday that Britain would take in “thousands more” Syrian refugees, after an outpouring of emotion over the image of a Syrian toddler lying dead on a Turkish beach put him under pressure to act. Cameron gave no precise figures, but a spokeswoman for the UN refugee agency told reporters in Geneva that the British move would improve the lives of 4,000 Syrians. Several of his own Conservative legislators and the human rights chief of the Council of Europe urged Britain to take in more refugees. 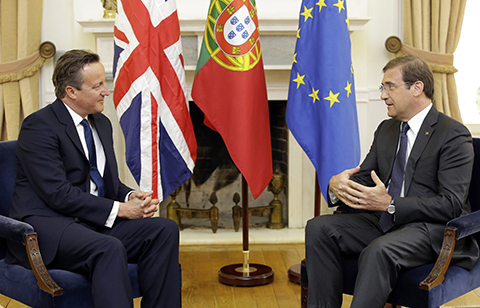 “Given the scale of the crisis and the suffering of people, today I can announce that we will do more in providing resettlement for thousands more Syrian refugees,” Cameron told reporters in Lisbon after meeting his Portuguese counterpart. About 5,000 Syrians who made their own way to Britain since the start of the war in their country have been granted asylum, and another 216 were brought to Britain under a UN-backed relocation scheme. “We will accept thousands more under these existing schemes and we keep them under review,” Cameron said, adding that the government would speak with humanitarian organisations and announce further details next week.